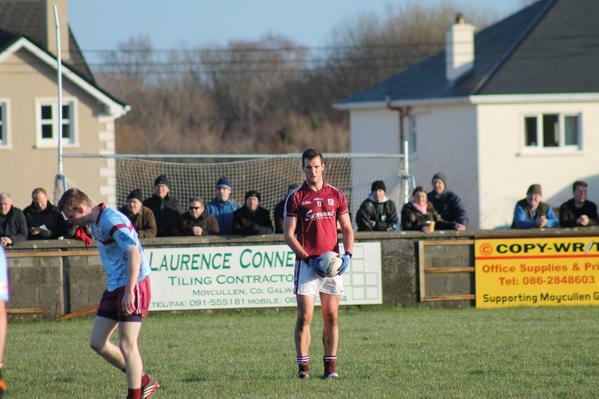 D'imir Seán Aindí Ó Ceallaigh mar lánchúlaí ar fhoireann Faoi 21 na Gaillimhe a theip orthu i gcoinne Longfort i gCorn Hastings le 1-7 i gcoinne 3-14 i mBéal Átha Liag, Longfort ar an Satharn, 3 Eanáir. Fuair Gaillimh siad an ceann is fearr ar Chill Dara ar an Satharn, 17 Eanáir i mBéal Átha na Slua, le 1-16 i gcoinne 1-10 agus ar Thiobrad Árann i bPort Omna ar an Mháirt, 20 Eanáir, le cúilín amháin, 0-10 le 1-6. D'imir Tadhg Ó Máille sa gcúl ina mbua ar Liatroim, 0-15 le 1-11 tar éis am breise, sa gcluiche leathcheannais ar an Satharn, 24 Eanáir i Mainistir Leathrátha, Co. Longfort chun áit a bhaint amach sa gcluiche ceannais i gcoinne Ros Comáin. D'imir Tadhg sa gcúl nuair a theip ar Ghaillimh sa gcluiche ceannais i gcoinne Ros Comáin ar an Satharn, 31 Eanáir, i Ráth Claon, Longfort. An scór deiridh: Ros Comáin 2-21, Gaillimh 1-11. Tháinig Ferdia Breathnach isteach mar fhear ionad sa dara leath ar fhoireann sinsir na Gaillimhe a fuair an ceann is fearr ar Sligeach i Sraith FBD Chonnacht le 0-14 i gcoinne 0-5 in Inis Crabhann i Sligeach ar an Domhnach, 4 Eanáir. Thosaigh Ferdia mar leath-thosach lár ar an fhoireann a fuair an ceann is fearr ar Institiúid Teicneolaíochta na Gaillimhe-Maigh Eo i Maigh Cuilinn ar an Domhnach, 18 Eanáir, leis an scór 1-13 le 0-5 chun áit a bhaint amach i gcluiche ceannais Sraith FBD i gcoinne Ros Comáin. Tháinig Sarah Ní Loingsigh isteach sa dara leath ar fhoireann Sinsir Ban na Gaillimhe a fuair an ceann is fearr ar mhná Thír Eoghan i Sraith Náisiúnta Peil na mBan i dTuaim ar an Domhnach, 22 Feabhra, le 4-15 i gcoinne 1-6 chun dul go barr an tábla. D'imir Tadhg Ó Máille sa gcúl do Fhoireann Faoi 21 na Gaillimhe a fuair an ceann is fearr ar Mhuigh Eo i gcluiche leathcheannais Chonnacht i bPáirc Mhic Éil, Caisleán an Bharraigh ar an Satharn, 21 Márta. An scór deireadh ansin: Gaillimh 1-12 Maigh Eo 0-11. Fuair Ríona Ní Fhlatharta agus Foireann Mionúir Cailíní na Gaillimhe an ceann is fearr ar Shligeach i gCraobh Chonnacht i gCaisleán Mhic Conchúir, Sligeach ar an Satharn, 28 Márta. An scór deireadh ansin: Gaillimh 15-14 Sligeach 1-0. D'imir Tadhg Ó Máille sa gcúl do Fhoireann Faoi 21 na Gaillimhe a theip orthu i gcoinne Ros Comáin i gcluiche ceannais Chonnacht i bPáirc Naomh Iarlaithe, Tuaim ar an Satharn, 4 Aibreán. 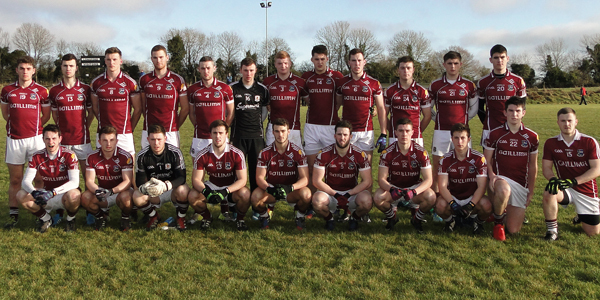 An scór deireadh ansin: Gaillimh 3-11 Ros Comáin 3-14. Fuair Ríona Ní Fhlatharta agus Foireann Mionúir Cailíní na Gaillimhe an ceann is fearr ar Ros Comáin i gCraobh Chonnacht sa gCreagán ar an Satharn, 4 Aibreán. Tháinig Ríona isteach mar ionadaí agus scóráil sí pointe. An scór deireadh ansin: Gaillimh 6-15 Ros Comáin 0-10. Fuair Ríona Ní Fhlatharta agus Foireann Mionúir Cailíní na Gaillimhe an ceann is fearr ar Maigh Eo i gcluiche ceannais Craobh Chonnacht i mBéal Átha hAmhnais ar an Satharn, 2 Bealtaine chun an 3ú craobh as a chéile a bhaint amach. Tháinig Ríona isteach mar ionadaí sa dara leath agus scóráil sí cúl iontach. An scór deireadh ansin: Gaillimh 3-15 Maigh Eo 2-6. Bhí Tadhg Ó Máille ar phainéal Sóisear na Gaillimhe a fuair an ceann is fearr ar Liatroim i gcluiche leathcheannais Craobh Chonnacht ar Pháirc Sheáin Mhic Diarmada i gCora Droma Rúisc ar an gCéadaoin, 6 Bealtaine chun áit a bhaint amach sa gcluiche ceannais i gcoinne Mhaigh Eo. An scór deireadh ansin: Gaillimh 1-11 Liatroim 0-7. Bhí Tadhg Ó Máille ar phainéal Sóisear na Gaillimhe a theip orthu i gcoinne Mhaigh Eo i gcluiche ceannais Craobh Chonnacht ar Pháirc Sheáin Mhic Diarmada i gCora Droma Rúisc ar an Domhnach, 17 Bealtaine. An scór deireadh ansin: Gaillimh 0-13 Maigh Eo 1-12. Fuair Sarah Ní Loingsigh agus Foireann Sinsir Ban na Gaillimhe an ceann is fearr ar mhná Mhaigh Eó i gcluiche ceannais Chonnacht i bPeil na mBan ar Pháirc Mhic Éil i gCaisleáin an Bharraigh ar an Domhnach, 12 Iúil, le cúilín amháin, 0-21 i gcoinne 1-17 chun Craobh Chonnacht a thabhairt leo don ceathrú bliain as a chéile. Fuair Ríona Ní Fhlatharta agus Foireann Mionúir Ban na Gaillimhe an ceann is fearr ar mhná An Cabhán i gcluiche leathcheannais na hÉireann i bPeil na mBan sa dTobar Chláir i gCo. na hIarmhí ar an Satharn, 18 Iúil, leis an scór 2-15 i gcoinne 1-4 chun áit a bhaint amach i gcluiche Ceannais na hÉireann i gcoinne Corcaigh. Theip ar Ríona Ní Fhlatharta agus ar Fhoireann Mionúir Ban na Gaillimhe an ceann is fearr ar mhná Chorcaigh i gcluiche ceannais na hÉireann i bPeil na mBan ar Pháirc Semple i nDurlas i gCo. Tiobrad Árainn ar an Luan, 3 Lúnasa, leis an scór 2-4 i gcoinne 3-10.